Many Blogs fall down even before starting properly just because of their Stats and Rankings. The Blog’s owner feel that his/her blog cannot get success with such rankings. Rankings plays a important role in the earning stats. Earning from Blogs is not so easy nowadays because of so much competitors websites on the web. Many Websites are created everyday on the web and many also stopped but however websites created are more than websites stopped. Every Advertiser check your website rankings like Alexa Rank, Pagerank, Domain Authority etc. before publishing ads on your website. Today We will discuss here about Alexa Rank only because discussing all in single post will be quite confusing and boring. Without wasting any further time lets move down to our Topic. Someone in the Contact Form asked me some days before, ” Why I need to improve Alexa rank “? Does the Same Question is also in your Mind? Lets find out its answer in one Simple Sentence. Question:Why I need to improve Alexa rank ? Isn’t the answer to his question or your question is so simple. The Concept is very clear. We need to improve alexa rank to increase our revenue. Almost every advertiser checks your Alexa Rank before advertising. Even When you want to sell your website you will need a good decent alexa rank. So, now without taking more time let us switch to our topic i.e How to improve Alexa ranking? If you write and update your website regularly with fresh and original content then absolutely your alexa rank will improve. You can follow a simple rule i.e don’t post a huge content on a single day rather post it regularly by dividing it. Alexa Ranking depends on how regularly you most not how much you post. E.g. : Rather than Posting 5 Posts on Single Day, Post 5 Posts, each on 1 day means post 5 posts in 5 Days. You can create a account on alexa.com and then after confirming your website ownership, you can easily get your website Alexa Rank Widget without any problem. It will help alexa to count every pageview of your website and you can really improve your alexa a lot with this widget easily. You can get the gode from alexa and then paste it in the text/html widget in your widgets section. After creating the account on alexa, you can also create a toolbar for your website easily from the alexa dashboard after confirming the ownership of your website. However, It may take some time to create the individual Alexa Toolbar but while creating you can add a lot of additional features to it like adding Facebook Page Link, Twitter Profile Links, Recent Tweets, RSS Feeds, own custom links and much more. The best feature of this toolbar is that it improves your Alexa Rank by huge difference. You can improve Alexa Rank even more by providing the Download and Install Link of the toolbar on your Website itself. The more no. of installations, the more improvement in alexa rank. 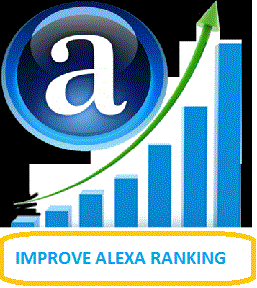 It is a very easy step to give more potential when improving your website’s Alexa Rank. It also help you a lot to improve your Alexa even more and earn some extra bucks. This is also one of the best step you can take to improve your website Alexa Rank. You might have noticed the reviews of the websites on alexa while checking a website alexa rank. You can ask your friends to give positive reviews of your website and even you can ask or request your readers to give positive reviews about your website. However its not a genuine way to improve alexa rank but it can still helps you a lot to improve Alexa Rank. It refreshed your website page automatically after a specific time period as setted up by the user. It will increases your pageviews by huge and hence it will result in improvement of Alexa Rank. All the 5 Steps mentioned above + bonus step mentioned will definately help you to improve your alexa rank. The Last Step i.e installing Auto Refresh Plus in still not suggested because its not a very genuine and preffered way to improve Alexa Rank but you can still use it to see even more improvement in Alexa Rank.